When the teams arrive in Melbourne for the opening race of the new season next month, only three teams - Ferrari, McLaren and Jordan - will field unchanged drivers line-up. For all the other drivers, the opening race of the year will be their first real opportunity to go head to head against the driver that they need to dominate most - their own teammate. On-track battles between teammates are always the most bruising, and the history of the sport is filled with stories of damaged egos and wounded pride. The harsh reality is that few seasons ever end without one driver in a team enhancing his reputation over the other, and sometimes a driver's whole career can be destroyed, leading to much bitterness and recrimination, especially if the 'losing' driver suspects that the team has not been treating him fairly. Amongst the teams that are fielding unchanged driver line-ups, the story is likely to be pretty much a repeat of last year. Rubens Barrichello will struggle for attention at Ferrari and is unlikely to get anywhere close to matching Michael Schumacher over the whole season. The David and Mika show, now in its sixth straight year, will come and go, and it will be a major surprise should Coulthard somehow manage to change the script we have become so used to in past years. The Jordan pair of Heinz-Harald Frentzen and Jarno Trulli are pretty evenly matched, but neither driver is the type to create lots of aggravation for each other or the team; if you are looking for fireworks perhaps the Jordan pit will not be the place to be. Over at Williams, however, the whole scenario is rather different. 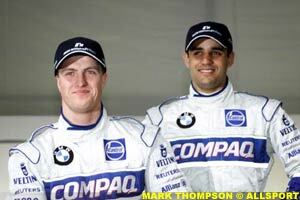 Both Ralf Schumacher and newcomer Juan Montoya have huge racing egos, and so both drivers will have a lot at stake over the coming season. Of the two, the pressure is most on Ralf to perform and really show the way home to his new teammate. At the end of the '99 season, the younger Schumacher was being freely tipped as a future World Champion. He had totally dominated the unfortunate Alex Zanardi, and a maiden win seemed to be well within his grasp. In Formula One the momentum of a driver's career is just about everything, but last year at Williams, Ralf Schumacher was suddenly confronted with a teammate who, despite his lack of experience, could match him for pace on a regular basis, and he didn't like it. More to the point, team owner Sir Frank Williams was somewhat disappointed with his driver's response to the challenge. "He had a few more bad days than he ought to have had", was how the Williams boss summed up his leading driver's season. Jenson Button, though, was a team player throughout his first season. Content to learn his craft and to avoid making unnecessary waves, he never aggressively tried to take advantage of Ralf's discomfort. No wonder Schumacher complained long and loud that he saw no reason to change the driving line-up of the team. Those that have observed Montoya's career closely during the last two years in North America, are adamant that Montoya is something special. He has, they say, that something extra that only appears once or twice in every generation. If they are right, and he can carry that ability into Formula One, then the team will subconsciously build itself around him, and like Frentzen before him at Williams, Ralf Schumacher might be forced to rebuild his career elsewhere. 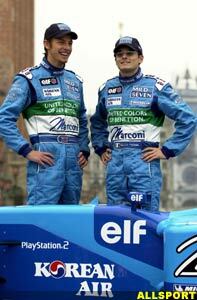 In some ways, Giancarlo Fisichella's position at Benetton is similar to Ralf's situation at Williams. In his first few F1 seasons, Fisichella was thought to be a superstar in the making. Some say that his fortunes have simply faded along with those of his team over the past two seasons, and that he is just a victim of his team's downward slide. Others speak of a lack of application in his approach. His sometimes-colourful team boss Flavio Briatore publicly blasted Fisichella's qualifying effort for the United States Grand Prix at Indianapolis, where he languished down in fifteenth position. After praising the approach of his teammate Alexander Wurz, he concluded the team's press release by stating that: "Giancarlo tried to rely on his talent, which is no substitute for hard work." Briatore's statement was strong stuff, and although no doubt he had his own agenda for making such a public criticism, it was maybe not the best way to motivate Fisichella, who was again outqualified by his teammate at the next two races in Japan and Malaysia, and some wondered whether he was as fully committed as he should have been. Now Fisichella faces, perhaps, his sternest test. The new Benetton has already struggled in pre-season testing and this year is already shaping up as a character-building year for both Benetton drivers. But, if Fisichella allows himself to be dominated by the hard working and talented Button, then he might struggle to maintain his position with a front-running outfit. Stylish and elegant driving has its place, but sometimes a top line Grand Prix driver needs to be a scrapper as well - a quality that seems to have disappeared from Fisichella's repertoire. 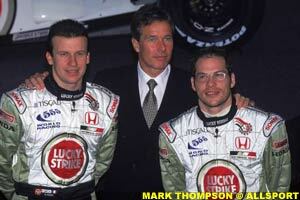 Lack of aggression is not a label that anyone is ever likely to pin on '97 World Champion Jacques Villeneuve. So when the news broke that Olivier Panis was heading back to a race seat at BAR alongside the French-Canadian - after rebuilding his confidence as a test driver for McLaren - there were a few pundits who questioned the wisdom of his choice. BAR has always been Villeneuve's team. It was built around him and with good reason. Amongst all the uncertainty surrounding the performance of a new outfit, he was the one known quantity in the equation. Hence, if the car was good enough, Jacques would win with it. Initially getting at least one car to the finishing line in the points was the team's overriding objective, and increasingly Villeneuve got the job done. Honda's sudden and unexpected decision to also supply their works engines to the Jordan team, took team boss Craig Pollock by surprise. More importantly for Panis, it also changed his priorities. Now, Pollock needs to ensure that whatever else happens, he finishes ahead of Jordan in the Constructors' standings, and to achieve this, he really needs to have two drivers capable of regular points-scoring finishes. Last year, Panis completed thousands of kilometres of testing with arguably the most disciplined team in the pitlane. More importantly, he has usually been able to match the pace of the two race drivers, David Coulthard and Mika Hakkinen - no surprise to those with a long enough memory to recall the Frenchman's pace, driving the Bridgestone-shod Prost during the first half of the '97 season. Panis has already given Villeneuve a wake up call, not only by his pace in testing, but by the way he has impressed Pollock and the team with his commitment and work ethic. If the Frenchman can translate this early promise into some strong early season results, Villeneuve might just have the toughest teammate fight on his hands since his debut year back in '96, when Damon Hill was able to dominate him. Amongst the other new combinations, Eddie Irvine, Jean Alesi and Jos Verstappen should not be unduly challenged by their new teammates, and given the various problems with their respective teams, are likely to receive the lion's share of the available resources anyway. The Nick Heidfeld-Kimi Raikkonen combination at Sauber would have to rank as the least experienced duo in many years, and so are unlikely to have much time left over to worry about teammate rivalries.